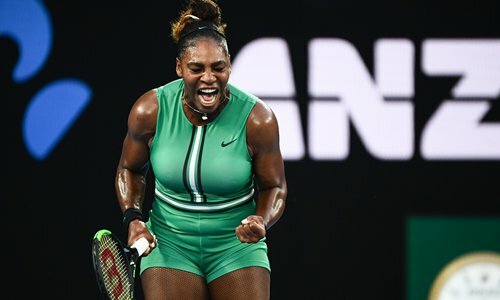 A fired-up Serena Williams slugged past world No.1 Simona Halep on Monday as she inches ever closer to a 24th Grand Slam title on a day that saw Alexander Zverev implode at the Australian Open. In a towering performance, the American great scored her biggest win since giving birth to break down the Romanian top seed 6-1, 4-6, 6-4 and move into a quarterfinal against seventh seed Karolina Pliskova. "I'm such a fighter. I never give up," declared Williams ­after the epic encounter. While Williams stayed cool, highly rated German fourth seed Zverev lost the plot against Canadian Milos Raonic, crashing 6-1, 6-1, 7-6 (7/5) and demolishing a racquet in a massive meltdown. Women's fourth seed Naomi Osaka was more composed as she beat crafty Latvian Anastasija in three sets to set up a meeting with ambitious Ukrainian Elina Svitolina for a place in the semifinals. But it was the dominant Williams who overshadowed them all and is overwhelming favorite to win an eighth Australian title, with defending champion Caroline Wozniacki and second seed Angelique Kerber already out. But the nuggety Romanian isn't world No.1 for nothing and she bounced back to set up a huge power struggle that Williams finally won with a break in the seventh game of the third set. It will be a new experience for whoever wins that showdown, with neither going beyond the quarterfinals at Melbourne Park before. The German has routinely been anointed as the flag-­bearer for the next generation, but again failed to live up to his reputation and has now missed out on making the last eight of a major 14 times in 15 attempts. "I just tried to stay composed and it worked out well for me today," said cool 16th seed Raonic, who will now face Frenchman Lucas Pouille.